Good joke. Everybody laugh. Roll on snare drum. Curtains. I didn’t come here to tell you that. One of the topics I’m frequently musing about in this venue is, what does it mean to sing “Byzantine chant”, and how best to teach it to a variety of people? Specifically in terms of that variety — what might it mean to have a pedagogical approach that assumes some knowledge of how to do it, an approach that tries to convey best practices to a person knowledgeable about music, just not Byzantine music, and then, what would constitute a misguided approach that throws misunderstood elements together haphazardly? For illumination on this point, I turn to — strange as it may seem during the third week of Lent — pastitsio. When Anna, Theodore’s nona, was first getting to know us back in fall of 2006, she asked us one day — “Can I come and make Greek food in your kitchen sometime?” Wow, twist our arms. What she made for us, and what she has made for us and others many times since, and what we also have learned how to make ourselves on a fairly regular basis, was pastitsio. You can call it “Greek lasagna” if you like; many do, including Michael Psilakis. To do so is kind of like calling Syriac “the language of Jesus”, though; there’s a certain sense that it makes, but it’s kind of misleading, and it doesn’t acknowledge the dish on its own terms. Pastitsio has multiple layers of long, hollow noodles (ideally, Misko #2 Pastitsio Noodles) with a flour-based Béchamel-cheese sauce and a meat sauce. It’s a Greek comfort food to be sure; not exactly the dish one is talking about in a conversation about the health benefits of the Mediterranean diet. All the same, my goodness is it delicious when made right, and a pan of pastitsio on the table is, in my experience, one of the best signs of a hospitable house, Greek or otherwise. Like all dishes, there are regional, familial, and maybe even political differences. To the right is Anna’s foundational recipe, a pretty basic, classic version that allows for some variation based on what you have on hand and what you prefer. It’s nothing particularly fancy, and it doesn’t take that long to make. You could do this with beef, veal, or lamb; you could do it with whatever cheese you have handy (and it doesn’t make any particular suggestions where that’s concerned); and it’s not picky about pasta. Maybe it’s a recipe that assumes, if you’re a Greek person who already knows how to cook this, you’ll know how to take this and, mutatis mutandis, turn it into “the way YiaYia made it”. And, if you’re not, well, you’ll use what you have handy and you’ll make it work in your own way. This is a classic Greek dish, which I often refer to as a Greek version of lasagna. You will need a deep, lasagna-style pan, and it may be hard to find the pastitsio noodles called for here. Try a Greek or Middle Eastern market or, of course, the Internet. The crucial thing is that the noodles be both hollow and straight, so you may substitute bucatini, perciatelli, ditali, or long, straight ziti laid end-to-end. This casserole, as with lasagna, must rest before serving to set, or it will be difficult to serve. Okay, already there’s a different tone here. This is a recipe written for somebody who knows food, but maybe doesn’t know Greek food all that well (and there’s the “Greek version of lasagna” shorthand). He details the essentials, and tells you where you need to find them. And this is definitely a little different. Oil instead of butter (he goes into his reasons for cutting olive oil with canola oil earlier in the book; basically it’s a cost issue, and you can use all olive oil if you really want to), the seasoning is a little more robust (and more characteristic of a Constantinopolitan approach, perhaps), and he’s more specific about the meat, the noodles, and the cheese. Elsewhere he talks about possible substitutes for cheeses; gruyere is his principal recommendation. This is an ingredients list that wants to show an American cook how to be faithful to the model using the best of what’s available. Make the kima sauce: in a large, heavy pot over medium-high heat, add the oil and the onion with the bay leaves and cinnamon sticks for 3 to 5 minutes. Add the ground beef and brown thoroughly. Add all the spices and the tomato paste and stir for 1 to 2 minutes. Add the water, tomatoes, vinegar, sugar, about 2 tablespoons of kosher salt, and a generous grinding of pepper. Bring to a boil. Reduce the heat, partially cover, and simmer for 65 to 75 minutes. Skim off the fat once or twice. Reduce until the sauce is almost completely dry. Proceed with the recipe, or cool and refrigerate. Preheat the oven to 350 degrees F. In a large pot of generously salted boiling water, cook the macaroni until almost tender, a minute or so before the al dente stage. Drain well. Spread 1 cup of the Greek Béchamel Sauce on the bottom of a deep roasting pan or lasagna pan, and sprinkle with 1/3 cup graviera. Lay half of the noodles out on top of the béchamel. You should have 2 to 3 layers of noodles. Spread another cup of the béchamel over the noodles, without disturbing the direction of the noodles, to bind them. Scatter with 1/3 cup of the graviera. Spoon all of the kima sauce over the top and smooth flat. Spread 1 more cup of the béchamel over the kima sauce, scatter with 1/3 cup graviera. Layer remaining pasta noodles over the béchamel. Spoon on the remaining béchamel and scatter with the remaining 1/3 cup of graviera. Bake uncovered until crusty, golden, and set, about 1 hour. If you don’t have a convection oven, you may want to increase the heat to 400 degrees F at the end, to brown the top. Cool for at least 40 minutes, to allow the custard to set so that the squares will remain intact when you cut them. Or, cool to room temperature, then refrigerate overnight. Greek béchamel differs from French béchamel or Italian besciamella due to the inclusion of whole eggs. When a dish is baked, the eggs in the sauce create a custard. This basic ingredient is what makes many Greek dishes so special. Because of the large quantity of flour and the resulting thickness of the roux, you really can’t step away from the stove while you are preparing the sauce. Plus, you’ll need muscle to stir it thoroughly. In a large heavy pot, melt the butter over low heat, whisking with a large balloon whisk. Add the flour and whisk to a very crumbly roux, not a smooth paste. Whisk constantly and energetically or about 5 minutes to cook off the raw flour taste, but do not allow to brown (slide the pot off and on the heat every now and then if you sense it is getting too hot). Still whisking constantly, drizzle in the warm milk until smooth. Continue cooking, adjusting the heat as necessary to keep the mixture at a very low simmer, until very thick. Whisk in the cinnamon, nutmeg, kosher salt to taste, and a generous amount of pepper. Scoop out about 1/4 cup of the warm sauce. In a bowl, whisk the sauce into the eggs to temper them. Remove the pan from the heat and whisk all the egg mixture back into the béchamel. Dude. I’m hungry. Maybe I shouldn’t be writing this during Lent. Dang it all. Anyway, some observations — first and foremost, this is not the quick ‘n dirty way to make pastitsio. The meat sauce, I can tell you from experience, takes more like 2-3 hours to reduce than the 65-75 minutes advertised, at least on the stoves I’ve used. At the same time — oh my goodness is the end result amazing and flavorful (such that Anna now uses Psilakis’ meat sauce in combination with her foundational recipe). Now, if you want to shave off time, just skip adding the water. With the basic recipe, if you know what you’re doing you might elaborate the bare bones instructions somewhat; by contrast, here, if you’re familiar with the dish, then you might simplify this version a bit. Both recipes, in the end, faithfully (I hate the word “authentically”) reproduce what is understood as “pastitsio”; one does so by presenting a basic, easy to reproduce (and vary) method, and the other does so by breaking the dish down and building it back up using the language and ingredients of American foodie culture. Now, you can have an argument over just how “Greek” pastitsio is. Real Greeks didn’t use Béchamel sauce until a hundred, hundred and fifty years ago, one argument might go. There’s something there with the meat sauce and the cheese and the noodles, maybe, but Béchamel? That’s an Italian or French corruption, not Greek. You might also have a conversation about some of the details. There are pastitsio recipes you can find that are adamant that no real pastitsio ever has had any kind of cinnamon or nutmeg or anything else in the meat sauce, because it doesn’t need it, period, and that’s not how YiaYia did it, dammit. BROWN meat with onions in large skillet; drain. Stir in spaghetti sauce and vinegar; simmer on low heat 15 min., stirring occasionally. MEANWHILE, melt butter in large saucepan on low heat. Add milk; bring to boil on medium heat, stirring constantly. Simmer on low heat 3 to 5 min. or until thickened, stirring frequently. Remove from heat. Stir in yogurt and nutmeg. Add macaroni; mix lightly. HEAT oven to 350ºF. 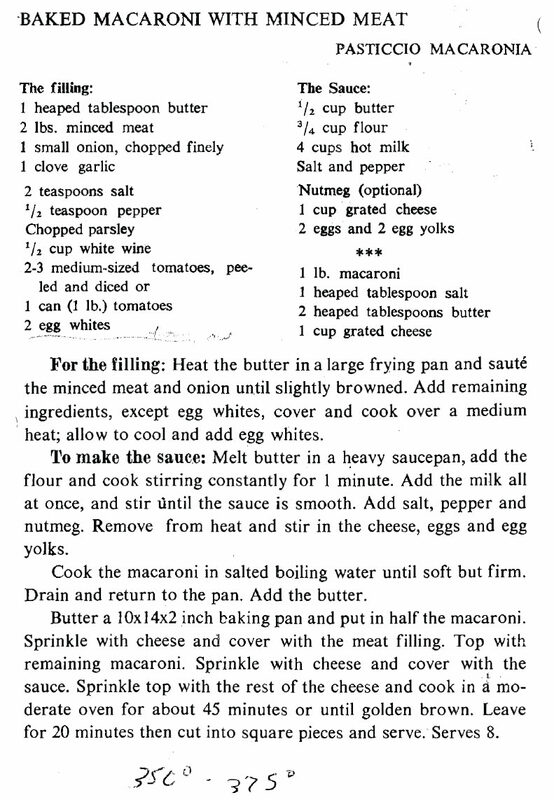 Spread meat sauce onto bottom of 13×9-inch baking dish; top with macaroni mixture and cheese. BAKE 45 to 50 min. or until macaroni mixture is heated through and top is lightly browned. Um, no. No, no, no, no, no. You want to insult a Greek person? Put this in front of them and call it “pastitsio”. This is beyond parody, really. This is macaroni and spaghetti sauce layered with yogurt and had some cheese sprinkled on it; no Béchamel, no attention to cheese, no nothing. This is a clueless American who vaguely remembers that there was a dish he had at a Greek festival or something that had noodles, meat sauce, some white stuff, and maybe a pinch of spice in it, making something up that sort of fits the general description, and adding “Greek yogurt” (nonfat? That’s not Greek yogurt, folks) and nutmeg to justify claiming that it’s “Greek food”. And, here’s the thing — by this point, pastitsio has been made at Chez Barrett a sufficient number of times that it isn’t really “Greek food”. It’s just “food you’re likely to eat when you’re a guest of the Barretts”. Or, for that matter, when we’re your guests; I made Psilakis’ recipe for Christmas Eve dinner one year at my mom’s house. Call it trying to pass on the tradition. Okay, back to the question raised at the outset about Byzantine chant. How might the analogy of pastitsio be applicable here? What’s the equivalent of Anna’s foundational recipe, what’s the equivalent of Michael Psilakis’ recipe, and what’s the equivalent of the Kraft recipe? and the melodies are notated using psaltic, or Byzantine, notation, and the notation is meant to be interpreted via a layer of oral tradition absorbed from one’s teacher. Now, I’ve phrased much of that carefully. Not all Byzantine chant necessarily employs a liturgical text; there are examples that set paraliturgical poetic texts. The description of Byzantine modes allows for some leeway depending on local tradition; Lebanese and Syrian cantors might do certain things differently, as might some Romanian cantors. It also allows for a way of talking about medieval repertoire that was composed before Chrysanthos or the 1881 Committee. The point about notation might perhaps be controversial to some, but I would leave it there, simply because, as a prosodic and musical system intended specifically for that purpose, psaltic notation is the symbolic system that best expresses the musical and hymnographic repertoire we call “Byzantine chant”. So what are ingredients that might be variable? Language, certainly; there’s nothing in that list that says that anything has to be in Greek or Arabic. It might be a lone man’s voice singing; it might be a choir of women. The point about oral tradition suggests that there is some level of acceptable variation of interpretation in some cases. There are different genres of hymns you can compose and sing within this framework; anything from quick, short, declamatory, syllabic hymns to long, slow, drawn-out compositions. And, certainly, there are lots of arguments about some of the details. This, that, or the other musical development in the repertoire isn’t “really” Byzantine music, but rather a corruption arising from Turkish influence. No cantor who knows what they’re doing would ever sing this phrase the way you just did it. Some would argue that language actually isn’t an acceptable variable, at least not the way described above; it either has to be in Greek, or it has to adapt a Greek original in a way that favors the Greek version over the target language of the translated text at every point. Alternately, language may be generally variable to an extent, but there’s no way no how English is an acceptable language for this music. That kind of thing. That’s from the pen of yours truly, written about ten years ago (do note that I do not credit a composer in the score, partially because even then I knew enough to know that I didn’t want to be blamed later). I cringe to show it to anybody because there is so much that it gets wrong, but in the spirit of being the chief of sinners, I’d rather hold up my own mistakes than point fingers at those of other people. First, it’s the wrong mode. Yes, fine, fourth mode is the mode appointed for this apolytikion, but this is the wrong version of fourth mode — it is diatonic (legetos) rather than soft chromatic, because apolytikia in fourth mode use soft chromatic. The second and third things wrong are related — this text actually is supposed to be metered for a model melody, usually known in English as “Be quick to anticipate”, which the melody I wrote doesn’t follow; alas, the text is not in fact metered, and the service book from which I got this translation doesn’t include a rubric for a model melody. You don’t know what you don’t know. Fourth, if you look at the model melody (Byz notation version in English here, staff notation here, or get them from 27 September here if those links don’t work) it really is one note per syllable for the vast majority of the hymn. 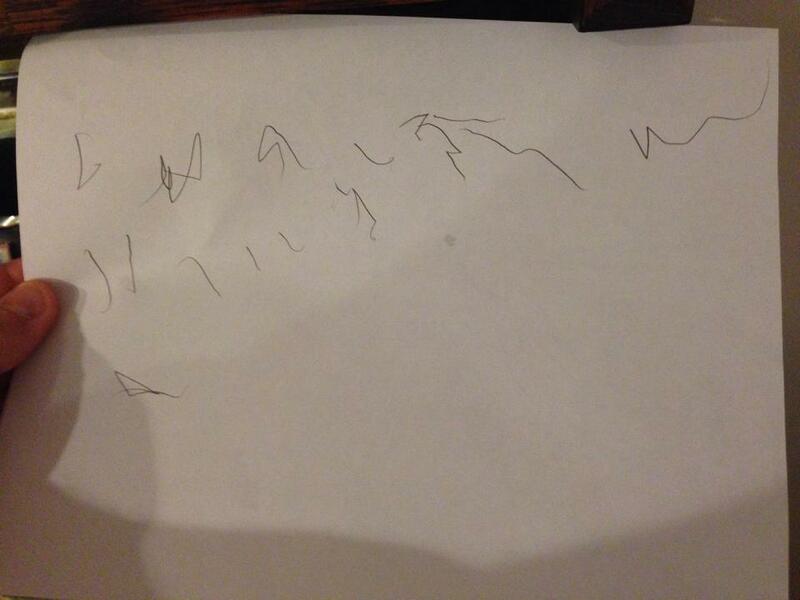 What I wrote isn’t obnoxiously melismatic, but neither is it sufficiently consistent in being syllabic. Fifth, it’s not a terribly sensitive setting of the text. I have no idea what I was thinking on “our God”, for example. Sixth, the use of drone is all over the place. It’s clear that this is by someone who has no idea what they’re doing on this point. Seventh, my use of the theses bears basically no resemblance to the reality of how classical scores use them, and since at that point I was almost entirely influenced by Kazan, it is probably is more Sakellarides-esque (if we can even aim that high) than anything. You can sort of see what I thought I was doing, but I may as well be using yogurt instead of Béchamel. Eighth, I made a deliberate choice to eliminate measures, partially because I felt that the “tyranny of the bar line” actually made Kazan much harder to use. This wound up obscuring the rhythmic structure that the piece should have had, and it had the technical effect, due to how Sibelius works, of obscuring how the accidentals function. Ninth, because I was just writing note to note in staff notation, with no understanding of how the rhetoric of the theses was constructed in psaltic notation, it’s made an even lesser effort than it otherwise was. If I had had even some knowledge of the notation and the orthography, a few of the problems could have been minimized a bit. In all of this, I was doing the best I could with what I knew, and I was doing so with foundational materials that were less than ideal but were what was available to me, to be sure, but that’s just the point — by way of comparison, I had had a taste of pastitsio at a Greek festival and thought, hey, I’m a good enough cook that I can replicate that — and I came up with a random combination of pasta, meat, cheese, and yogurt based on ingredients I had on hand. Yes, sometimes one makes stew with what one has (you knew I’d get back to that eventually), and one might argue that it’s not that bad on its on merits (if one were being maximally charitable), but you can’t really call it pastitsio, at least with no disclaimers or scare quotes. Thankfully, these days there are more resources that allow one to go a route that is more along the lines of Michael Psilakis, taking apart the tradition and putting it back together for an Anglophone Orthodox audience that perhaps has decent musical sense but needs detailed help for Byzantine music. What is still needed is greater access to teachers who can provide enough of a living connection to the material, such that that one can manage with a more bare-bones set of resources, like the basic pastitsio recipe, but we’re getting there. In taking advantage of such resources, ideally we would produce a body of Anglophone repertoire that is both composed and sung knowledgeably and faithfully, and as a result, Byzantine chant would eventually become something that is no longer perceived as “Greek” or “Arab” or foreign in general, but simply “what we sing”. We can apply this, really, to any Orthodox musical idiom, and even any element of Orthodox tradition; a confused jumble of ingredients put together out of a lack of understanding doesn’t actually cultivate a real “American” expression of anything. It’s exactly that — a confused jumble of ingredients. We’re far better off putting in the time and the humility to learn from people who know what they’re doing and have a living connection to the tradition. Yes, it will take longer, yes, it may take trying some things that don’t work the first time, yes, you may have to un-learn and re-learn some things. Be that as it may — certainly, in the case of pastitsio, the end result tastes a heck of a lot better. I am looking up briefly from the Scrivener window at my carrel in the Holy Cross library. I have to say, it’s been a lovely time thus far. The library has been excellent for my purposes; at IU, I had to have 30-40 items out via interlibrary loan at any given moment, but here, I’ve only had to ILL 2-3 books. Fr. Joachim Cotsonis, the library’s director (also the Byzantine lead seals specialist), and Hilary Rogler, the circulation and ILL librarian, have been wonderfully helpful at every turn. I’m getting a lot done, and it’s been due in no small part to their help. A chapter went out to my advisor a couple of weeks ago; I’m hopeful that I will have another one out sooner than later. A couple of weekends ago we drove back to Indianapolis (yes, drove; airfare for three of us for a weekend just wasn’t going to be worth it) for the wedding of our dear friend Laura Willms, the Tall Ray of Sunshine herself, as well as one of the Orthogals, and the Executive Board secretary of the Saint John of Damascus Society. Flesh Of My Flesh was the koumbara, so we left Thursday evening and arrived in Indy on Friday afternoon in time for the bachelorette party. Saturday was a crazy day of rehearsal stuff, which I was semi-involved with because I was part of the wedding choir. Sunday, we attended Divine Liturgy at Holy Apostles, which was very much like being home again, even if for the rest of the trip it felt very strange being back. The wedding itself then followed at Ss. Constantine and Helena, an OCA parish under the Romanian Episcopate, and it was quite a wedding service; besides their pastor, an archpriest from St. Tikhon’s and a ROCOR priest from Detroit were also concelebrating, and it was a grand affair to say the least. Following that, we enjoyed ourselves at the reception, and then it was time to make the trek home. We headed out Sunday evening, and got back to Brookline Monday afternoon. Many years to Laura and Gabe! I would like to give a shout out to Summer, our hostess; we used Airbnb to find a place to stay, and it was our first time doing so. We lucked out — we found a lovely cottage in the Irvington neighborhood that was really comfortable, more than reasonable price-wise, and conveniently located. Summer has done a lot with the place to make it homey and welcoming, and I highly recommend booking with her if you need accommodations in Indianapolis. I’ll also mention an experience that I had while we were out there that demonstrated for me how much the PDF has changed the business of the copy shop. I needed (or so I thought) to print out my music for the wedding, so I went to the FedEx Kinko’s in Broad Ripple to print it out. I had been e-mailed 20 separate PDFs, and I had them on my iPad. I asked somebody behind the counter, is there a way I can print these directly from the iPad? No, they said, and we can’t touch them because they’re music PDFs. We have to have written permission to copy before we can do anything with sheet music behind the counter. Before I forget, I should note that I had Theodore with me, and that FedEx Kinko’s is a really bad place to take squirrelly two year olds. But, whatever, okay, fine. I worked at a Kinko’s 10 years ago, and I know my way around, more or less. I went to one of the pay workstations to transfer them from my e-mail to a thumbdrive. Theodore was taking a little too much interest in the workstation’s CD drive, though, so I tried to make it quick. I took the thumbdrive over to one of the copiers. The first thing I noticed was that the copiers could access Dropbox, and they were also able to access mobile devices directly. Grr. That’s why I asked, people behind the counter. The second thing I noticed was that there was no way to batch print PDFs; I had to go through something like five screens to print each one individually. With twenty PDFs to print, each taking an individual series of fine motor skills to do so, keeping Theodore under control quickly became like trying to juggle Jell-O. I got two printed out before Theodore cheerfully realized that the main power switch on the copier was exactly at his eye level. Okay, I said, you see I’ve got a toddler with me. Is there an easier way to do what I’m doing? Well, she said, you could batch print from a workstation, but they’d be five times the cost. There’s really nothing else that can be done? I printed the remaining PDFs as quickly as Theodore would allow me to do and left. I also theoretically needed to buy a black binder, but at that point I was irritated enough at their lack of helpfulness that I didn’t want to spend any more money there. So, I texted the choir director, saying, hey, do you have an extra black binder? He texted me back saying, yeah, I’ve got all the music printed out and in binders here already. This capped off what has been a year of weddings; last October, our friends Phil and Lisa got married at All Saints, the next month was the wedding of our Indianapolis friends Fotios and Diana, the sister of Theodore’s godmother got married in Illinois this last May, and then in July, Benjamin, Theodore’s godfather, got married in Cleveland (at the Deer Hunter church, no less). I also got pulled in to chant a wedding at St. Mary’s Antiochian Orthodox Church in Cambridge the weekend before Gabe and Laura’s wedding, bringing me full circle back to point of origin for the Boston Byzantine Choir, whose Mystical Supper was the first CD of Orthodox music I ever bought. At this stage of the game, I’ve seen a lot of Orthodox weddings. I remember going to my first; it was in Fort Wayne, and it was 10 years ago. I was still at the OMGEVERYTHINGISSOAMAZINGLYBEAUTIFUL stage of my inquiry, and that was pretty much what I had to say about the wedding service. Since then, I’ve chanted a couple (not many, just because of the nature of the parishes where I’ve chanted for the most part), I’ve sung in a choir for a few; I’ve been koumbaros for a few; I’ve stood in the congregation for a few. I’ve seen first marriages between converts, first marriages between converts and spouses who don’t plan on converting, first marriages between cradles and converts, first marriages between cradles and non-converts, second marriages between converts, and second marriages of converts to spouses who have no intention of converting. I don’t think I’ve yet been to a wedding service for two cradles, but I assume that’ll happen here before too long. I’ve been to weddings under a lot of different circumstances. One of the second marriage services was between two divorced people who basically shopped for a bishop who would sign off on the second marriage when the bishop at their home parish dragged his feet. I’ve seen converts convince the priest (a Serbian) to allow kilts and bagpipes in the church for the service. I’ve seen two priests marry off their kids together. I’ve seen weddings that are pro forma ceremonies for people who have been married for years but need crowns so that their bishop will accept the husband as a seminarian. I’ve seen an Orthodox/non-Orthodox coupling do an Orthodox service with, essentially, a Protestant service then performed at the reception. I’ve seen the koumbaros get asked to serve at the last second because the non-Orthodox groom didn’t realize that his non-Orthodox close family member couldn’t do it until the priest told him. I’ve seen converts marry where one spouse’s family is Protestant, the other spouse’s family is also Orthodox, but to make it even more fun, the Orthodox family at some point decided to go non-canonical Old Calendar, even though the child in question stayed in a canonical jurisdiction. I’ve seen the non-Orthodox spouse grumble about the layout of the church and their own lack of “lines”. I’ve seen converts marry where one family is unchurched, the other family is polemically anti-Orthodox, and both families are big enough that the only Orthodox in attendance at the service are up at the solea because the couple couldn’t make room on the guest list for more than a couple of their church friends. I’ve seen the betrothal done months in advance because the couple wanted the engagement to be more than just an engagement in the worldly sense; I’ve seen it done separately because the non-Orthodox spouse was was worried about the length of the service for non-Orthodox attendees. My observation, on the whole, is that the wedding can really present something of a conundrum for the non-Orthodox participants, be they spouse or family of the spouse. This conundrum can be handled well, or, well, not; somebody — a convert who married a convert — once told me that in some ways, he/she wished that they had gotten married before they converted. They could have gotten married at the church of one of the families, then been baptized, then been crowned, and it would have amounted to the same thing without making the day itself such a lightning rod for contention. This is also not exclusively an Orthodox conundrum, I should hasten to add. Neither my wife nor I had any Anglican family when we got married in the Episcopal Church way back in the day; her background being Catholic, there were certainly some issues there, and my background being a combination of unchurched/militant atheist and Evangelical, the high church (well, as high as we could make it in a suburb of Seattle) ceremony and the Catholic-ish sense of things was difficult for some of my people, too. Some of it, for better or for worse (so to speak), is the service itself. It’s not that long as wedding services go (our Anglican wedding, with full Eucharist, was an hour and fifteen minutes long), but to the extent that the secular norm now seems to be something like 10 minutes long (“Do you think this is a good idea?” “Yes.” “How about you?” “Yes.” “Okay, you’re married.”), the 45 minutes to an hour that most Orthodox weddings I’ve been to have lasted probably seem intimidating, and since there are no vows, there’s nothing really for the non-Orthodox crowd to hang their hat on in terms of familiarity. And, oh wow, you guys still do that Corinthians reading? Is that even legal in 2014? Some priests insert commentary as they go, and that can be a help, but it can also be really cloying if not done well. Other priests charge on through, and hopefully somebody’s put together a well-annotated service leaflet. Some of it, though, I have to imagine is simply non-Orthodox participants realizing that they’re marrying off somebody close to them at a Greek/Russian/whatever Orthodox wedding, seeing the crowns, and thinking, People still do this in this day and age? I guess it’s cute that they think all of this matters, but, really? We’re not Hindus or whatever. Couldn’t you just do the aisle and vows and call it good for the sake of everybody else, and if this other stuff is so important to you, do it on a day when we all aren’t trying to share it with you and looking stupid because we don’t have a clue as to what’s going on? We can’t even say the Lord’s Prayer right in here. What the hell happened? It’s like I’ve said before; we converts hope, in our heart of hearts, that when people visit our churches it will be the Russian Primary Chronicle again, with the non-Orthodox not knowing whether they were in heaven or on earth but knowing that God dwells there because of the beauty. That just isn’t what happens, for the most part. People come to weddings in America in 2014 to participate emotionally, not to see a beautiful service. When they don’t feel like they have a way to do that (or a reasonable way to explain why they don’t have a way to do that), it’s just not the same, no matter how beautiful of a service it is. To be clear about something — I’m not criticizing the service or converts getting married. I love the Orthodox wedding service; I love participating as cantor (I wish I’d had the opportunity to chant more of them than I have), and I love just being there as a supportive onlooker. If you’re listening to the words (or following along with a booklet if it’s in Greek or Slavonic or what have you), there’s no way to get around how grounded in the Scriptures it is, so ideally, I think the wedding service should serve as a way to make the non-Orthodox feel more at home with what’s happening, and I think it’s unfortunate that that isn’t what happens. The message of the service is, plainly, You’re married, and now God’s in charge, and it seems to me that that should be entirely unproblematic. At the same time, what is evident from some of the weddings I’ve seen is that however earnest the participants, that message can be obscured by how the receiver sees the sender, and there isn’t an easy way around that. If I were to make what would be intended as helpful suggestions — first of all, to everybody concerned, perspective is your friend. The wedding is a big event, but it’s not the marriage. Whatever happens at the wedding, theoretically you’re going to have to deal with each other for the duration. Compromise and getting along is part of the deal, both between spouses and with family; start now. Second, to the couple, include your immediate family in at least some of the discussions with the priest. If you let them participate in those conversations, and give them a chance to ask their questions in the presence of the priest at a meeting that actually matters, they will at least feel included, what’s going on the day of will seem a lot less daunting, and there will be a lot less tension about things unexpressed. To the family, if your kids ask you to come to one of those meetings, go. Everybody will be happier. To bride and groom: the great thing about an Orthodox wedding service is that it’s purpose-built. In terms of the specific parts, you don’t need to customize anything. If you want specific settings of the hymns or whatever, a specific cantor, specific choir members, particular crowns, multiple priests, that kind of thing, okay, but really, it’s already all there and ready to go. That’s a gift, not an imposition; it means you have less you have to worry about. The less you make it about you, the less subjective you make the service, the less you’re going to have to freak out about, and the less everybody else will see reason to be concerned. To the groom, whatever the convert/cradle situation might be for you: part of Orthodox tradition is that, ideally, you get married in the bride’s hometown. What that would indicate to me is that there is supposed to be some visible deference on the part of the groom to the bride’s family, to say nothing of the bride, who is easily the most vulnerable person involved. To the extent that you’re able to do so, when the bride’s family says something, smile and keep your mouth shut. If it’s an issue with the service, let the bride handle it, or, if you’ve been good about inviting the family to the meetings with the priest, tell the priest, and let him handle it with the family. Most important: let it go, whatever it is — start keeping a ledger of your sacrifices now and you aren’t likely going to stop. To the bride: it’ll all be okay. To everybody else: it’s an hour out of your life. You’ll live. Listen to the service, read along, whatever, but keep in mind that the message is, You’re married; now God’s in charge. Every part of the service expresses that somehow; if you want something to do to engage what’s going on and watching and following along isn’t enough, then ask yourself as the service goes on, how does this part of the service express that message? If that doesn’t do it for you, well, again, it’s an hour out of your life, and it’s not about you. Don’t worry; if it’s a proper Orthodox wedding, the reception is going to be a blast. Suggestion to all concerned: wear comfortable shoes. Whatever the circumstances, you’ll be a lot less inclined to be grumpy by the end of the service. Okay. I’ve got to write about the Akathistos hymn now. Pray for me. Having mused on some of the issues in the background of Cappella Romana‘s new recording, Tikey Zes: The Divine Liturgy of St. Chrysostom, now allow me actually to review the disc. In 1991, Tikey Zes published a score titled The Choral Music for Mixed Voices for the Divine Liturgy that was intended to be more or less “complete” (with some abbreviations customary in West Coast parishes of the Greek Orthodox Archdiocese of America), with all eight Resurrectional apolytikia, the Antitrisagia (“As many as have been baptized”, “Before your cross”), variants for a Divine Liturgy of St. Basil, several patronal apolytikia for parishes, as well as variants for a hierarchical service. Although up to this point Zes had relied primarily on John Sakellarides’ simplifications of Byzantine melodies as his source material, for this setting he composed his own melodies, employing a variety of polyphonic textures and different kinds of counterpoint as well. The express intent, according to the CD’s booklet, is a musical style that is less a harmonized melody and is rather polyphonic in the sense that one typically means when describing Renaissance music. The score also uses organ accompaniment, but principally to accompany unison vocal lines and only occasionally being used independently of the choir. Cappella Romana gave Zes’ score its concert debut in 1992, prompting him to revise and expand it in 1996, with the new edition dedicated to the ensemble. It is this new edition that Cappella presents on the recording; they have supposed the second Sunday after Pentecost, when the Resurrectional cycle of modes will have reset to the First Mode — the first so-called “vanilla Sunday” since before the Lenten cycle began — and they have also included the apolytikion for St. Nicholas in the place of the parish’s patronal troparion (Zes’ home church is St. Nicholas Greek Orthodox Church in San Jose, California). As with previous Divine Liturgy recordings, they present a good deal of the liturgical context, with the celebrant’s and deacon’s parts here presented by, respectively, Fr. John Bakas of St. Sophia Cathedral in Los Angeles (and who, coincidentally, is discussed at some length in this post from last week) and Fr. John Kariotakis of St. John the Baptist Church in Anaheim, California; in addition, parishioners of Holy Trinity Cathedral in Portland, Oregon are featured reciting the Creed and the Lord’s Prayer. Some things are abbreviated; unlike The Divine Liturgy in English, the 2008 Byzantine chant release, there is not the luxury of a double-disc treatment. Nonetheless, the presentation goes to some pains to be something other than another recording of disconnected, individual pieces of music; rather, this is a Divine Liturgy that happens to be using Zes’ score. Let’s be clear: the music isn’t “Byzantine music”, and both Zes and the choir are well aware of this (despite a comment in the booklet that is easily misunderstood, and I’ll come back to that). My previous post covered just what the implications are of that, and I suggested that Greek American polyphonic choral music might better be understood as cousin of rebetiko — that is, a folk repertoire that comes into its own in a context of emigration. That’s one aspect, perhaps, of what Zes is doing, although he is elevating it considerably; this is maybe the equivalent of somebody writing a bouzouki concerto. He is taking the music he knows from the context of the Greek American choir loft — Desby and Sakellarides and so on — and re-articulating the ethos in the musical language of an artistic high point in Western sacred music. It’s as though the Byzantines who fled to Venice eventually managed to capture the attention of Monteverdi and convince him to convert and compose for the Orthodox Church — which, again, fits pretty well with the idea of a repertoire of émigrés (although I may be stretching the notion beyond its utility). That isn’t to say that there’s something self-conscious about how Zes uses polyphony. I don’t get the impression that he’s saying, “Hey, let’s imagine what would happen if Italian Renaissance composers wrote music for the Divine Liturgy.” I rather get the idea of a very gifted and highly-skilled composer asking, no more and no less, “What’s going to be the best that I’m able to do for the service of the Church, and what’s going to be the most fitting musical vocabulary that I know how to use for such a project?” (I refer you back to my previous post for the arguments over whether or not that’s an appropriate question to ask in the first place; I’m reviewing the recording on its own terms.) The result does not sound like Tikey Zes “doing” Palestrina or Monteverdi; at least as sung by Cappella Romana, it just sounds like beautiful church music. Now, to be honest, I have absolutely no idea if any churches use this particular score liturgically. Obviously lots of GOA parishes use Zes’ music (for that matter, so do Antiochian parishes), but I don’t know how commonly used this particular setting is. The disc suggests that the choir that could sing it properly would certainly be a luxury ensemble; while the responses and shorter hymns are kept simple, the liturgical high points are when Zes does not shy away from gilding the things he loves. I’m trying to imagine the parish choir that could sing the longer hymns like the Trisagion or the Cherubikon, both absolutely glorious pieces of choral writing, without it being an overreach. Which brings me to the one thing I’ll say in terms of the whole organ/choir question in this review — if I close my eyes and imagine the church in which I would hear this liturgy being sung, it’s King’s College Chapel with a dome and iconostasis. This is not necessarily a bad thing, musically — in fact, I’d go so far as to say, if you’re going to go the organ/choir route, if that’s really the aesthetic you want to embrace, then you need to do it at least as well as it’s done on this recording. Yes, my consultant was quite right, Cappella Romana does sing Zes’ music like it’s Palestrina — but that also sounds like that’s exactly how it’s written to be sung. If that means the sound is like Anglican choirs singing in Greek instead of Latin or Elizabethan English — well, fine, then, so be it. Run with it. But do it well. Because if you can’t sing it at least this well, then there’s no point in using it. If you’re going to use luxury repertoire like this in your parish choir, then your parish choir better be able to fight its weight. Otherwise it isn’t going to be pleasant experience for anybody, and it will be a distraction in church, drawing attention to itself by virtue of being badly done. Now, maybe, this score could be said to be like the Rachmaninoff All-night Vigil, which was written as a concert piece but occasionally gets broken out for liturgical use for special occasions. I will say that the Fathers John, as the celebrant and deacon, are both exceptional singers, and the net effect of the two of them plus Cappella Romana is not unlike a Bach Passion, with the celebrant and deacon perhaps in the Evangelist role. That is, there is a sense of the Divine Liturgy-as-drama with what the two clergy bring to their “roles”, so to speak, with the choral ensemble commenting on the liturgical action. Lord knows there has been sufficient analysis of the Great Entrance alone as a “dramatic” moment that maybe that’s not altogether uncalled-for; what I would say is, if you’re going to go for that, make sure you have forces at the altar and in the choir loft that can actually do it. I said earlier that this isn’t “Byzantine music”; the booklet might seem to suggest otherwise, with the very last sentence of Alexander Lingas’ essay apparently referring to the score as “thoroughly Byzantine”. However, Lingas is not here referring to musical style or compositional technique. He is by no means offering a psaltic apologia for Zes, arguing that the music is, in fact, actually in continuity with Byzantine chant if we would just listen to it the right way. He can be doing no such thing, since this very last section of the essay is his analysis of how thoroughly un-Byzantine the music is, with its imitative and invertible counterpoint, for example. The observation that Lingas is making is that, in spite of musical discontinuity with the received tradition that we have that is in continuity with Byzantine music, it is clear that Zes is re-articulating the ethos of the Byzantine aesthetic in a Western musical language. Zes, in other words, while he is using a different musical language than Byzantine music, is nonetheless bringing considerable technical skill to bear, using counterpoint and polyphony and organ to ornament and to expand and to demonstrate virtuosity where Byzantine music ornaments and expands and demonstrates virtuosity. To make a brief point relating this disc to my previous two posts — I got the following comment in a note from a friend of mine about the Zes recording: “[…]it might actually be the most ‘American’ setting…with influences from various cultures (eastern and Western Europe like our own culture here), organ etc. the irony of course is that it’s not even in English.” Looked at from a standpoint of what we might call “acculturation” or cultural adaptation, then, yes, I’d agree — and even the retention of Greek is, in its own way, a very American thing to do, since we like to emphasize and privilege our “pre-American” heritage, even in — perhaps especially in — an American context. At the same time, going by Fr. Oliver’s analysis, then the impulse to “restore” Byzantine chant is also a very “American” thing to do, given our “restorationist” tendencies. It is telling to me that Cappella Romana has dedicated a total of four discs over the last five years to recordings that present more-or-less complete settings of the Divine Liturgy — the 2-disc set The Divine Liturgy in English for Byzantine chant, and then the Michaelides and Zes recordings. All three of these releases strike me as “pastoral projects”, as attempts to change the game in terms of the ideal of sound that’s thought of as possible — Byzantine chant in English? Yes, it can be done perfectly well in English in a way that’s still perfectly acceptable Byzantine chant, and here’s how good it can sound, too. Greek American polyphony? Yes, actually, here’s some music in that genre you’re probably not doing that you should at least think about (the Michaelides), and here’s how the really good stuff by the composer you all say you like could sound. All of this is to say, Zes’ score is a remarkable piece of sacred choral composition on its own terms, and Cappella Romana is up to its usual high standards in terms of presentation of it. I don’t mean “presentation” to only mean singing; it’s an extraordinarily well-sung recording by all involved. Rather, the care to use the recording as the opportunity to make the case for what its liturgical use could sound like (I hesitate to use the word “should”) is also remarkable, and a hallmark of the recording. Another hallmark of the release is an exceptionally informative booklet that provides the Greek and English text of the Divine Liturgy, as well as Lingas’ essay positioning Zes’ music in the context of Byzantine music, Orthodox music more generally, and Greek emigration to the United States. Again, I will leave the argument over whether or not it “should” be used liturgically, or even recorded by an ensemble by Cappella Romana for that matter, to others in other settings; I find it to be a worthy recording of some exceptionally beautiful music composed by a man who sincerely wants to give the best of what he has, and judge it on those terms.